SSDs are getting ridiculously fast—and rather toasty. Solid-state drives are getting absurdly fast—so much so that they're starting to outpace the interfaces they're supposed to plug into. And that trend doesn't appear to be slowing down anytime soon. 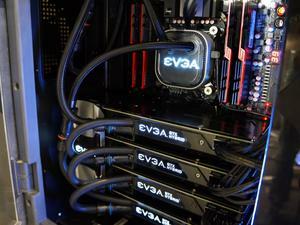 At this year's CES, Intel showed off a massive liquid-cooling rig for its SSDs that featured two of its blazingly speedy PCI-E 750-series solid-state drives. and while you don't need a liquid cooling system to keep your drives from overheating just yet, those days might be closer than you think. As it stands, the consumer-grade Intel 750 drives come with massive aluminum heatsinks, but those heatsinks are dwarfed by the ones on the commercial-grade 750-series drives. The NAND flash memory chips and onboard processors inside PC-grade SSDs are getting so hot and so fast that it may not be too long before SSDs have onboard fans, as our Gordon Ung explains in the above video.